My instagram and blog feeds are FULL of juice cleanses and detox diets and summer-influenced clean eating nonsense. Other than a few weeks in January when people feel the need to do penance for an indulgent holiday season, you rarely hear of people cleansing or detoxing in the middle of winter. Warmer weather brings out the urge to detox, cleanse, reset, whatever. And I get it – bathing suit season is storming towards us, and for some folks that is a daunting prospect. But let me tell you this important truth: you don’t need to do a detox to wear a bathing suit. You don’t need to do a detox, period, and I’ll get to that, but let’s start here. I spent 16 years working as a lifeguard, and have seen people of every shape and size wearing bathing suits. People in big bodies, people in small bodies, people in round bodies, people in hairy bodies. Alllllll the bodies. So I can tell you, with authority, that literally anyone can wear a bathing suit. Body + bathing suit = bathing suit body. And what’s more, people can wear any kind of bathing suit they please. One-piece, two-piece, string bikini, burkini, just put it on. Last year I shifted from a bikini to a schmancy pants one piece that I love a lot. I had a baby and my body is fundamentally different than it was before, so my old bikini (which was quite old) didn’t feel as comfortable. This year, I’m back in a two-piece, primarily because nothing else fits, and because I think a big ol’ pregnant belly in a bikini is a rocking thing. Flaunt it, mammas! With my changing body has also come a fundamental shift in mindset; a realization that my body is a freaking miracle. I grew a human and birthed that human and used my strong and mighty body to keep that human alive. And guess what? Your body is a freaking miracle too! You have strong legs that carry you around, or arms that give hugs, a heart that loves people, and a stomach that digests food to fuel your awesome body and brain. Guess what you also have? A complex and wonderful system already in place to clear your body of waste and toxins. Which bring me back to the detox/juice cleanse/spring cleaning situation, and why you don’t need to do it. First of all, your body is NOT full of toxins! Each and every day our bodies are exposed to a variety of substances, ranging 100% natural to synthetic. Some of these substances, even the totally organic ones, are incredibly toxic to the human body. 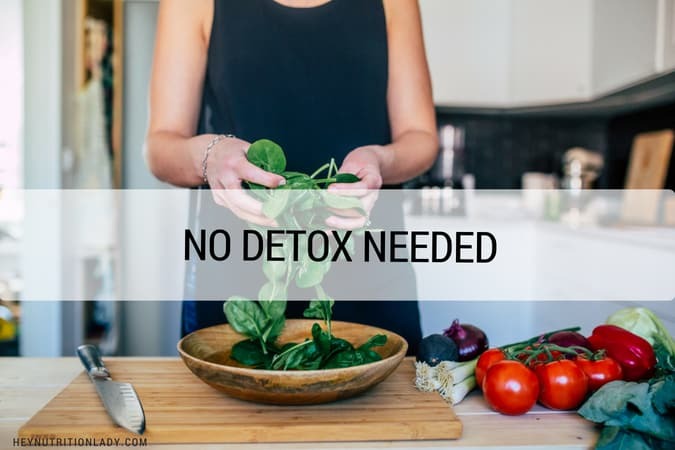 Luckily, our bodies are smart little machines and come naturally equipped with a system that both defends against and gets rid of unwanted or harmful substances. This system includes our skin, gastrointestinal system, lymphatic system, kidneys, and liver. Ah yes, the liver. The kidneys. Don’t those hard-working organs need our help to do their jobs? No, no they don’t. It’s true that the liver and kidneys are filtration organs, but it’s not like say, a swimming pool filter (something that I have been intimately acquainted with) that needs to be shut down and cleaned out on a regular basis. No, your smart AF body does the cleaning all by its self AND keeps working at the same time. The liver performs a series of chemical reactions to break down toxic substances into ones that can be eliminated in either bile or urine. And the kidney excretes waste products into our urine. Just like that! Like I said, your body is a miracle. And hey, if listening to your body and real-life experience has taught you that you genuinely feel better when you consume nothing but juice for 3-5 days, then power to you. If I’ve learned one thing over many years of studying nutrition it’s that we are all unique creatures and what works for one doesn’t work for all. But, if you’re contemplating a cleanse or a detox with a sense that you should be undoing some wrong, or a sense of shame, or a hope that doing so will help you become a certain size and that becoming that size will make you a happier, healthier person, then please, please reconsider. Fresh vegetables and fruits. Lots of them. Movement. Walking, swimming, biking, yoga, running, whatever. Your body wants to move. Carbs – for real, friends. Your brain thrives on carbohydrates. I prefer mine complex and whole. Protein – plant-based or otherwise. Healthy fats, like avocados, nuts, olives, etc. Water! To drink, bathe, and swim in. Appreciation – be good to your body, it’s working around the clock for you! Totally agree with you about our miraculous bodies – but sometimes due to significant illnesses , our kidneys and liver cannot function at their full efficiency. I gave up worrying about wearing a bathing suit- I just don’t go to the beach and lie in the sun anymore- bathing suit “worry” has been replaced by worry about skin cancer, even using sunscreens, as well as the aging effect of too much sun. Oh, I’m not talking about sun bathing, I certainly don’t do that (I’m super sun paranoid), I mean getting into a bathing suit to move your body! And it’s a time of year that tends to get people twitchy, so let’s talk about it. I just love how you think and how you are able to put your thoughts into words. Always have, always will. Thanks for you for that. Brilliantly written article and I totally agree with everything you say. I’ve inhabited my body for 53 years and although it occasionally lets me down (current situation: very badly stretched foot ligaments from a hard fall and on crutches; long-term situation: lupus) I have done quite well without every engaging in a detox. At work, I see cancer patients every day and some of them wish to do a detox either on treatment or after treatment. But once I explain, just as you have, how we have plenty of organs to do just that they usually feel satisfied to nourish their bodies with a wide range of real foods and plenty of water. It is natural to feel that your body has let you down when you have cancer or another serious illness but it is important to realise that your body wants to thrive and has all the tools to do so. As for the bikini thing, of course, we know that as soon as someone goes on holiday and starts eating and drinking as normal any weight loss (because it is water loss really) immediately reverses. If we want to lose a bit of weight, slow and steady actually does win the race. Great insights, Kellie. Of course it’s natural to feel let down by your body in the case of significant illness, but I think the pressure put on people for what they should do or should have done, is insane. People telling a cancer patient (or any kind of patient) that they could have helped their bodies work more efficiently by cleansing or detoxing or eating more coconut oil or whatever other nonsense is floating around is downright awful. Glad they’ve got you as the voice of reason! Love this post. Our bodies are amazing machines and I always hate hearing about detoxing and juice cleanses. I know, me too! It’s such nonsense, so let’s be the voice of reason out there! Great article! We are lucky to have you to put the pish posh on some of these silly diets and trends. I’m gonna go treat my body to a walk right now! Are we still good with caffeine and red wine on moderation? Asking for a few friends . ..
Oh how I needed to read this today! I am a nutrition student and had a friend ask me this morning about diet pills. I feel like a family member or friend asks me at least weekly about a different extreme diet or cleanse and no matter how many times I explain how unnecessary and oftentimes dangerous they are, they keep coming back for more. I guess I should get use to this considering I plan on making a career as a nutritionist but it can be so frustrating! I hear ya, Molly! I remember one time after a VERY slim friend asking me for weight loss advice turning to another friend and asking, is this what I’ve signed up for? A lifetime of skinny girls asking me how to lose weight? And my friend looked me in the eye and said, um, yes. I think the key to keeping frustration at bay is to practice what you preach (eat real food! enjoy it! moderation!) and trying to be the change, if you know what I mean. Well-written post! Love the messages. “Body + bathing suit = bathing suit body”. Our bodies are unique and beautiful and don’t need detoxes and cleanses to work. Yes! All bodies are beautiful!